I had always considered making a change whenever I watched a particularly moving video on animal welfare, but never went through with it. 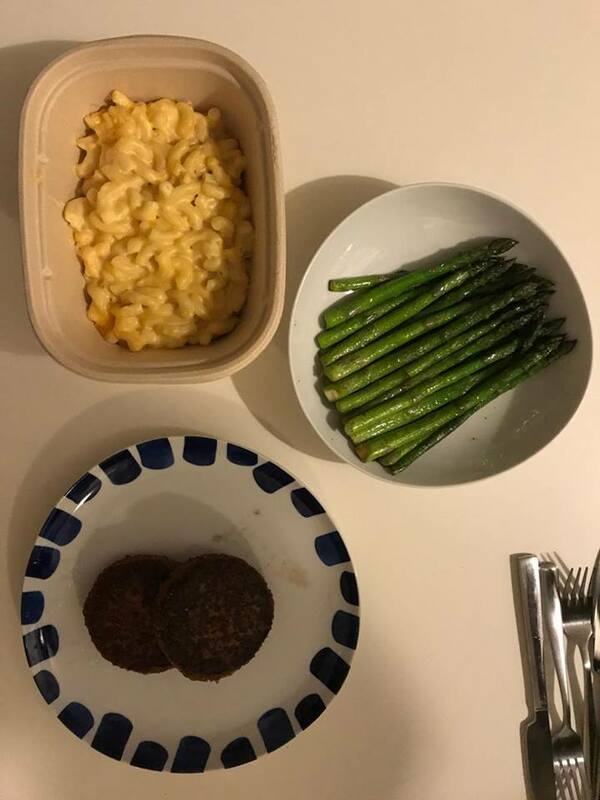 After years of putting it off, I finally decided to go vegetarian for a week. I never particularly liked meat, and usually chose tofu as my protein when given the choice. One of my friends had gone vegan for a year and told me I should try it, too. Going vegan seemed like too much of a jump, so I decided to make vegetarianism a stepping stone. 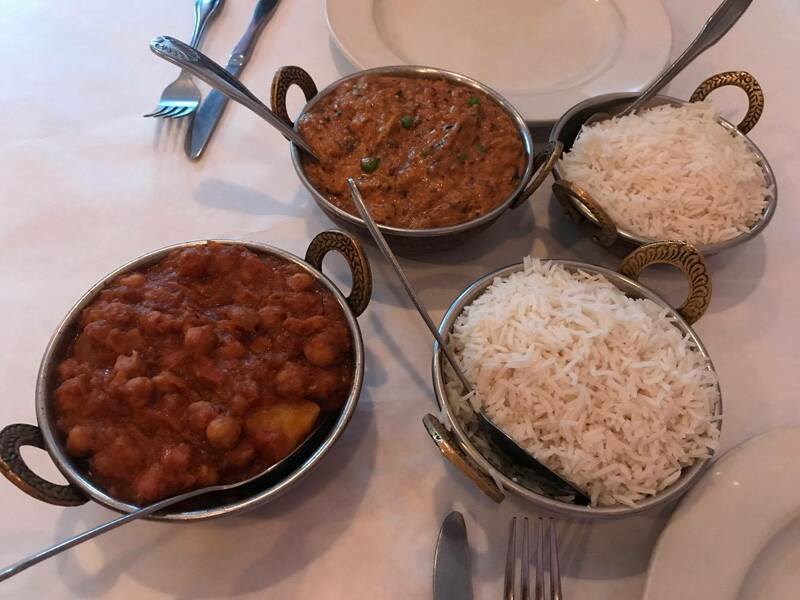 On Monday, a friend suggested we get Indian for dinner, and after looking up the menu for Mumbai Indian Grill, I agreed. I ordered the Aloo Chana, a curry made of chickpeas and potatoes. Between the blueberry bagel from Einstein’s I had for lunch and the curry, I was definitely consuming a lot of carbs. The menu at Mumbai had a separate vegetarian entree section, which made it easier for me, as I didn’t have to be tempted by non-vegetarian options. My friend ordered an eggplant curry, so that I could try that as well. My other friend, however, decided he would order my favorite curry, the Chicken Tikka Masala. Thanks a lot. The two vegetarian curries were delicious, as were the rice and naan. For Tuesday lunch, I decided to head to my number one on-campus dining spot: International Dish. 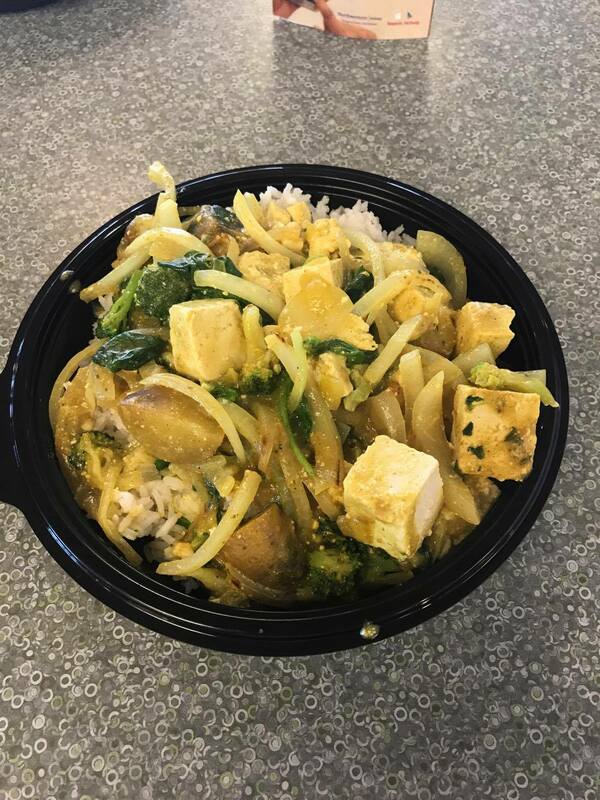 Because I often get tofu as my protein, I thought ordering tofu would be an easy way to have a filling lunch while not breaking my vegetarian diet. But as I looked up at the TV screen listing the choices of sauces, I realized that the sauces I usually ate were all non-vegetarian. During my vegetarian week, I had four different sauce and carb combinations, all with tofu. Out of the four, only one was a success. Tuesday’s lunch of Indian curry and white rice was not. 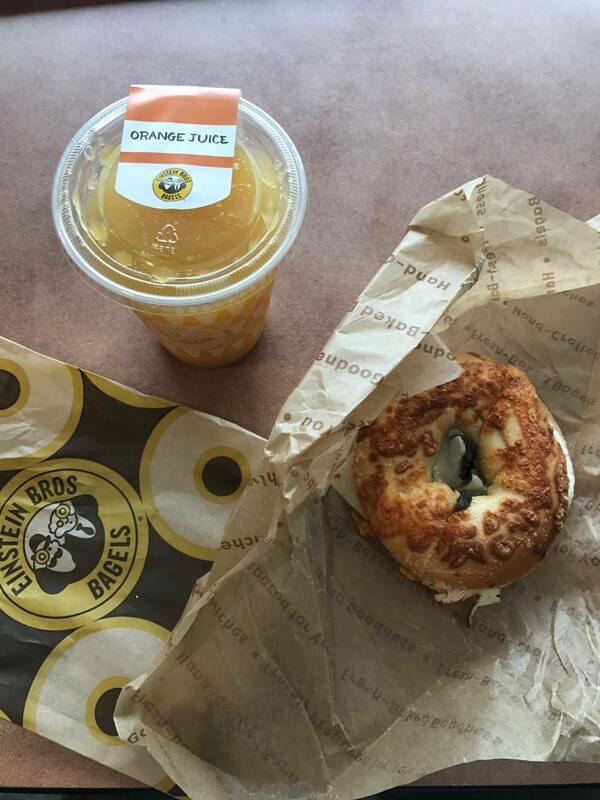 I grabbed an egg sandwich with spinach, mushroom and swiss and an orange juice from Einstein’s while waiting for my next class to start on Wednesday morning. Although I missed the savory crunch of bacon in my sandwich, it was still pretty great. At the very least, the sandwich kept me full until lunch, which consisted of a rather disappointing salad from Frontera. My first meal on Thursday consisted of another less-than-stellar creation at International Dish. The only vegetarian protein option seemed to be jackfruit, and I could get it in a torta, taco or burrito. Because I was craving carbs, I went for the burrito. 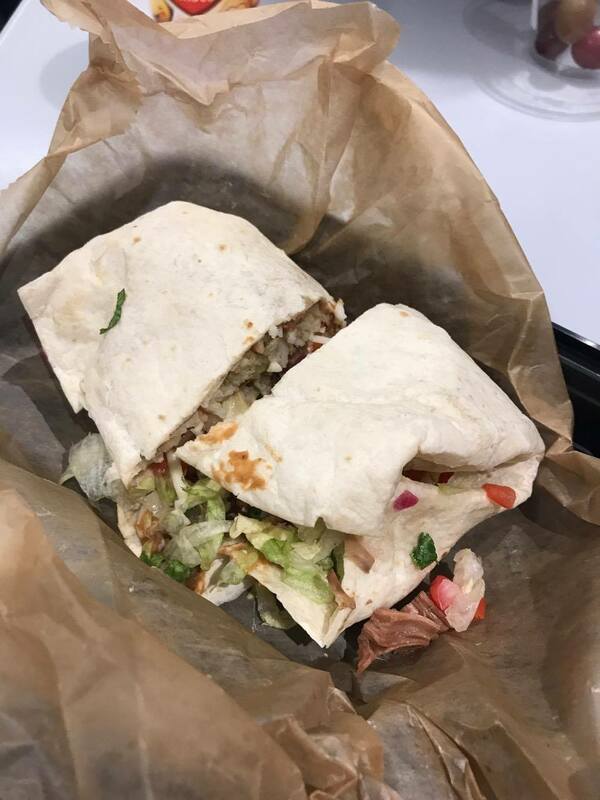 I usually love eating fruit with other food (I’m a fan of pineapple pizza), but jackfruit in a burrito wasn’t a good combination. I ended up picking out whatever lumps of jackfruit I could, and eating the remaining mix of tortilla, rice, onions and tomatoes. I went grocery shopping at Whole Foods with two friends, who were making salmon with cream sauce for Friday’s dinner. I tagged along and picked out a plant-based burger patty. Just in case it didn’t turn out well, I also bought a box of mac n’ cheese from their hot food bar. The patties were actually smoky (although that might have been because I burned them a bit), and if they had been in an actual burger, I’m pretty sure I wouldn’t be able to tell they weren’t meat. But my friends’ cream sauce and sauteed onion covered salmon looked amazing, and I couldn’t tear my eyes off of it. Maybe I should have tried going pescatarian, instead? I had a scare Saturday afternoon; while I was eating a bowl of Cocoa Puffs, my suite-mate suddenly asked me if it was vegetarian! For a second, I was terrified that I had broken my vegetarian diet, until I realized I was eating something very far from meat and he had made a mistake. My biggest challenge of the week was Saturday dinner, when my friends and I had a barbecue. For some reason, I ended up in charge of cooking the meats, which meant I had to cook pork belly, steak strips, chicken breasts and Italian sausages. 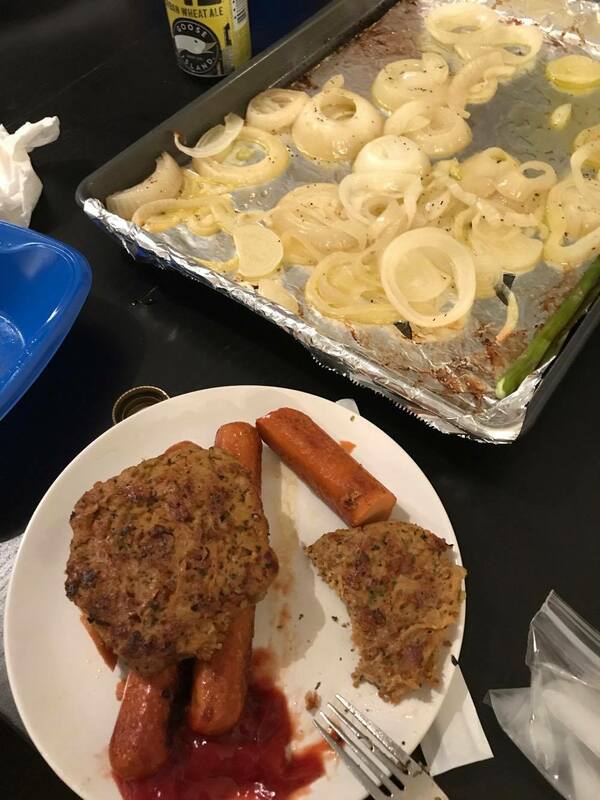 After throwing onions, asparagus and pineapple on the heat, I fried up the vegetarian sausages and patties I bought. They didn’t taste bad, but still paled in comparison to the meats that were heaped on the table. I ended up sitting on the couch and eating a pint of ice cream to console myself. Hosting a barbecue as a vegetarian was clearly a bad decision. I had meeting after meeting on Sunday, and it wasn’t until mid-afternoon that I was able to make my way to Norris to grab a late lunch. Subway was one of the few options that was open, and after discovering the existence of a veggie patty, I was sold. Thanks to the sweet onion sauce and guacamole, the sandwich was quite good, and I could actually taste the slices of carrots and red peppers in my veggie patty. Despite my friend enjoying his sandwich with bacon across me, I was content with my own. 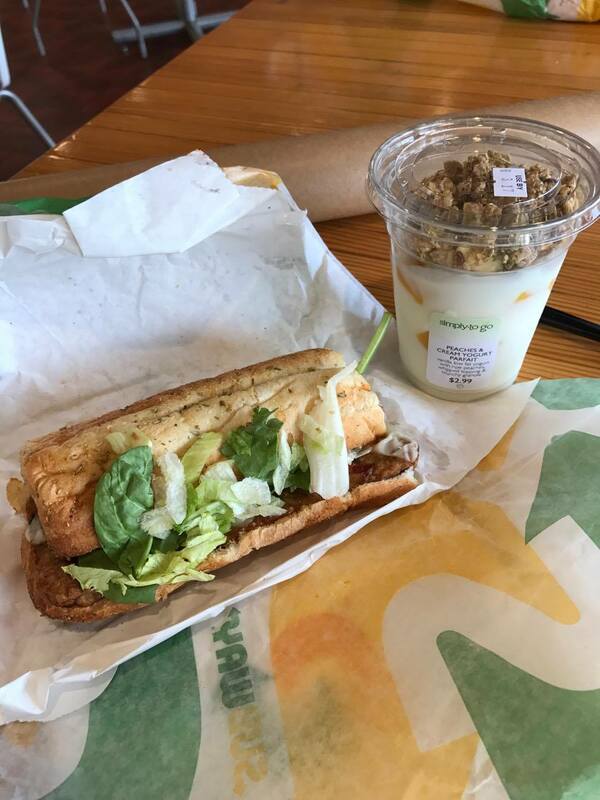 I finished my meal with one of my favorite items from the C-store, a Peaches & Cream Yogurt Parfait, looking forward to meaty Monday. Although I am not a meat-lover, having to consciously avoid meat when making meal choices made me painfully aware of what I was missing. By Thursday, there was nothing more I wanted than a good cheeseburger. My favorite meal definitely was the falafel and hummus bowl from Naf Naf Grill, which I would get again even if I were allowed to eat meat. I was surprised to find out that there was actually a large variety of things I could eat as a vegetarian, regardless of whether I ate on campus or not. I previously thought I would end up eating a salad for every meal, but instead I was able to tag along whenever my friends decided to eat downtown. The one difference I really noticed was how I would get hungry sooner, mainly because a large portion of my meals consisted of carbs. I originally thought I might lose a few pounds, which was not the case. I also learned that my friends could definitely be split into two groups: those who supported and ate vegetarian meals with me, and those who questioned what I was doing and laughed at my veggie patties.